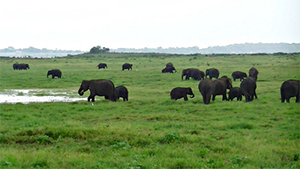 Sri Lanka is the proud home of 86 species of mammal, pride of place going to the magnificent elephant, the second largest terrestrial mammal surviving today. These fascinating animals can be seen with relative ease in most of the parks, in large herds of extended families as well as lone males. 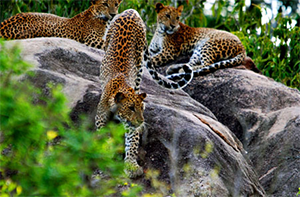 Sri Lanka is also famous for the beautiful solitary leopard, best sighted at dawn or dusk when these adaptable predators come down from the shade of the trees to hunt. Other predatory animals, which can be found in Sri Lanka, include the sloth bear, golden jackal and mongooses. Primates such as common langurs and a wide variety of monkeys (such as the endemic macaque, purple faced leaf monkey and shaggy bear monkey) demonstrate their remarkable agility by swinging from branch to branch, often in huge troops. 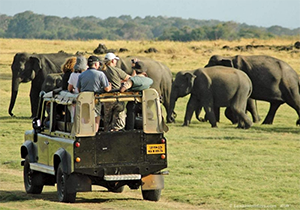 As with the beaches and temples Sri Lanka is blessed with a fantastic array of National Parks from Horton Plains (no jeeps allowed) to those famous for their elephants or bird life. A few of the National Parks in Sri Lanka are mentioned below with more details available on request. Kaudulla National Park Opened in 2002, this is Sri Lanka's newest national park, wildlife reserve and eco tourism attraction. Situated around the ancient Kaudulla tank (man made lake), the national park provides a 6656 hectare elephant corridor in order to provide safe migratory passage for these fantastic creatures. Bundala - Bundala National Park Bundala National Park, covering an area of 6216 hectares, is located about 250km southeast of Colombo. The biodiversity of this park is immense: a total of 383 plant species have been recorded from the park. Minneriya - Minneriya National Park Located between Habarana and Polonnaruwa, the 8890 hectares of Minneriya National Park consists of mixed evergreen forest and scrub areas and is home to Sri Lanka 's favourites such as sambar deer, leopards and elephants. However the central feature of the park is the ancient Minneriya Tank (built in 3rd century AD by King Mahasena). 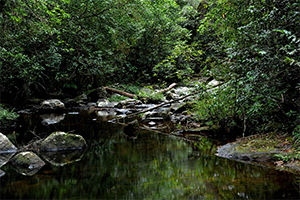 Sinharaja Rainforest A world heritage site and major eco tourism destination, The Sinharaja Rainforest is a rich treasure trove of nature with a great diversity of habitats and a vast repository of Sri Lanka 's endemic species found no where else in the world.